Researchers have developed the technology for a catheter-based device that would provide forward-looking, real-time, three-dimensional imaging from inside the heart, coronary arteries and peripheral blood vessels. With its volumetric imaging, the new device could better guide surgeons working in the heart, and potentially allow more of patients' clogged arteries to be cleared without major surgery. 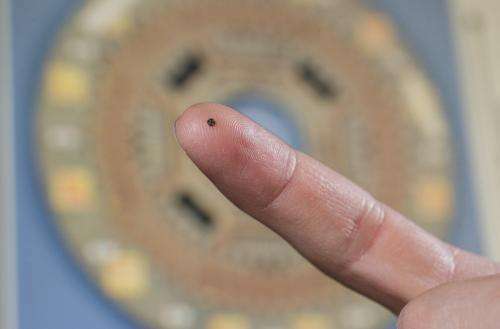 The device integrates ultrasound transducers with processing electronics on a single 1.4 millimeter silicon chip. On-chip processing of signals allows data from more than a hundred elements on the device to be transmitted using just 13 tiny cables, permitting it to easily travel through circuitous blood vessels. The forward-looking images produced by the device would provide significantly more information than existing cross-sectional ultrasound. Researchers have developed and tested a prototype able to provide image data at 60 frames per second, and plan next to conduct animal studies that could lead to commercialization of the device. "Our device will allow doctors to see the whole volume that is in front of them within a blood vessel," said F. Levent Degertekin, a professor in the George W. Woodruff School of Mechanical Engineering at the Georgia Institute of Technology. "This will give cardiologists the equivalent of a flashlight so they can see blockages ahead of them in occluded arteries. It has the potential for reducing the amount of surgery that must be done to clear these vessels." Details of the research were published online in the February 2014 issue of the journal IEEE Transactions on Ultrasonics, Ferroelectrics and Frequency Control. Research leading to the device development was supported by the National Institute of Biomedical Imaging and Bioengineering (NIBIB), part of the National Institutes of Health. "If you're a doctor, you want to see what is going on inside the arteries and inside the heart, but most of the devices being used for this today provide only cross-sectional images," Degertekin explained. "If you have an artery that is totally blocked, for example, you need a system that tells you what's in front of you. You need to see the front, back and sidewalls altogether. That kind of information is basically not available at this time." The single chip device combines capacitive micromachined ultrasonic transducer (CMUT) arrays with front-end CMOS electronics technology to provide three-dimensional intravascular ultrasound (IVUS) and intracardiac echography (ICE) images. The dual-ring array includes 56 ultrasound transmit elements and 48 receive elements. When assembled, the donut-shaped array is just 1.5 millimeters in diameter, with a 430-micron center hole to accommodate a guide wire. 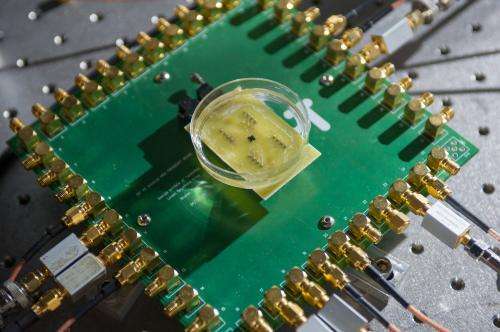 Power-saving circuitry in the array shuts down sensors when they are not needed, allowing the device to operate with just 20 milliwatts of power, reducing the amount of heat generated inside the body. The ultrasound transducers operate at a frequency of 20 megahertz (MHz). Imaging devices operating within blood vessels can provide higher resolution images than devices used from outside the body because they can operate at higher frequencies. But operating inside blood vessels requires devices that are small and flexible enough to travel through the circulatory system. They must also be able to operate in blood. Doing that requires a large number of elements to transmit and receive the ultrasound information. Transmitting data from these elements to external processing equipment could require many cable connections, potentially limiting the device's ability to be threaded inside the body. Degertekin and his collaborators addressed that challenge by miniaturizing the elements and carrying out some of the processing on the probe itself, allowing them to obtain what they believe are clinically-useful images with only 13 cables. "You want the most compact and flexible catheter possible," Degertekin explained. "We could not do that without integrating the electronics and the imaging array on the same chip." Based on their prototype, the researchers expect to conduct animal trials to demonstrate the device's potential applications. They ultimately expect to license the technology to an established medical diagnostic firm to conduct the clinical trials necessary to obtain FDA approval. For the future, Degertekin hopes to develop a version of the device that could guide interventions in the heart under magnetic resonance imaging (MRI). Other plans include further reducing the size of the device to place it on a 400-micron diameter guide wire.